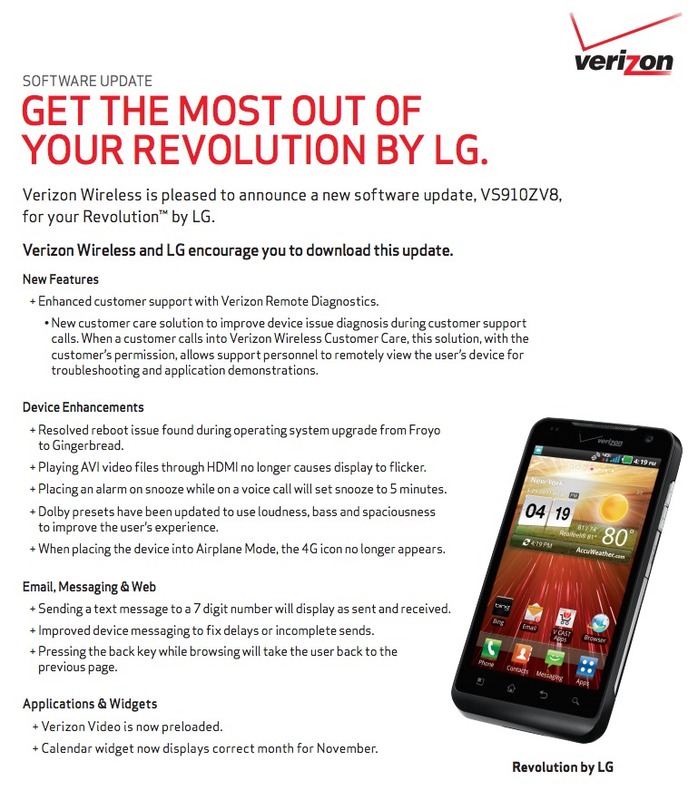 Over the weekend, Verizon pushed a support document to their LG Revolution site indicating that an update was imminent. That update looked normal for the most part and included bug fixes, Verizon Video, and more. What wasn’t normal though, was the section under “New Features” that read “Enhanced customer support with Verizon Remote Diagnostics.” What on Earth could that be? The key point to that paragraph is “with the customer’s permission.” It’s essentially a remote login type of service for VZW service reps to use during support calls to better assist you. We have to assume that it’s a piece of software that will sit in the background of your phone that can be activated once you give them the thumbs up. That scare anyone a bit? In a day when you can’t visit a tech site without seeing something to do with privacy, all we can do is try to take Verizon’s word for it on this one. If it indeed turns out to be some sort of tracking tool that is engaged without customer consent, you can imagine the lawsuit. Now the big question is, which phones will see it next? And if they do, can we opt out of having it on our phone? As someone that handles their phone without ever having to call customer service, this is something I do not want on any of my phones.